At some point during the 2018-19 NFL postseason, I decided — again — that I was done with The Corner Office. Between my full-time job, freelance writing gigs that actually pay, and having a life away from the computer, managing a website that is essentially a hobby is tough to do. More than once since I launched The Corner Office back in 2014, I had come to a decision to put it down and discontinue the whole operation. But eventually, something would compel me to pick it back up. This season followed that familiar script. It began with my renewed commitment to producing content, but sometime in October, I fell behind on updating the site. The next thing I knew, the calendar was turning to 2019 and I felt like I had too much on my plate to continue with something that, frankly, isn’t making money or attracting a ton of readers. But then Super Bowl LIII came and went on Sunday, and it reminded me not only why I started The Corner Office in the first place, but also why I want to keep it going. In case you missed it, the New England Patriots beat the Los Angeles Rams 13-3 to capture pro football’s unofficial world championship. Through Sunday night and into Monday morning (when I began writing this column), the story lines and narratives among professional media and social media almost all revolved around Patriots quarterback Tom Brady, head coach Bill Belichick, and wide receiver Julian Edelman, who was named Super Bowl MVP. Meanwhile, the Patriots defense — which emphatically shut down the NFL’s second-most prolific offense — hasn’t gotten nearly its fair share of praise or credit. During the 2018 regular season, the Rams ranked No. 2 in the NFL with 32.9 points and 421.1 yards per game. In the Super Bowl, the Patriots held L.A. to three points and 260 yards. A game that was widely predicted to be a high-scoring shootout turned into a low-scoring struggle in large part because the Pats’ defense dictated the outcome. My full-time job involves poring through articles and headlines from a large collection of mainstream and local sports media outlets, and during Monday’s shift I saw very few that focused on New England’s defense. Those that did usually zeroed in on Belichick’s defensive game plan, or on Rams QB Jared Goff’s struggles. At best, the Patriots’ defense has been praised as a unit, its individual players lumped together as one instead of getting the singular attention similar to that devoted to Brady, Belichick or Edelman. At one point, early on Monday, it appeared that the only New England defender who had garnered any articles specifically about him was backup safety Duron Harmon, who made headlines by declaring he would not visit Donald Trump’s White House should the Pats be invited. Later in the afternoon, New England DBs and twin brothers Devin and Jason McCourty were also the subject of articles about their choice shun the White House as well as their timetable for making a decision on whether or not to retire this offseason. What I didn’t see were many headlines calling out individual Patriots defenders for how well they played in Super Bowl LIII. That lack of attention given to defensive players, and defensive backs in particular, is why I created The Corner Office. As fans and media members, so much of our football bandwidth is dominated by quarterbacks, coaches and offensive skill-position players. Think about every one of the 159 game previews and position-by-position breakdowns you read or listened to ahead of Super Bowl LIII. How many of them discussed the Patriots and Rams’ defenses as a unit? Probably all of them. How many of them categorized defensive players individually, like how Brady or L.A. running back Todd Gurley or New England tight end Rob Gronkowski were categorized? Probably none. Let’s look at what New England’s secondary did on Sunday. Stephon Gilmore had five tackles, three pass breakups, a forced fumble, and made the game’s biggest defensive play with a leaping interception late in the fourth quarter near the goal line that prevented a game-tying touchdown. There’s no reason why Gilmore, a First Team All-Pro cornerback, couldn’t have been voted Super Bowl MVP. The offense only scores 13 points and they give MVP to Edelman but the D only gave up 3 points and Gilmore had forced a fumble, a int, 3 PBUs and 5 Tackles!?! Smh no respect for the masterpiece on Defense! New England cornerback Jason McCourty made what was probably the second-biggest defensive play of the game. He broke up a pass in the end zone intended for L.A. receiver Brandin Cooks that would’ve been a go-ahead touchdown for the Rams late in the third quarter. McCourty finished with five tackles and two pass breakups. 1. How did Jason McCourty save a potential Brandin Cooks TD? The Patriots led the NFL in man coverage rate during the 2018 campaign. 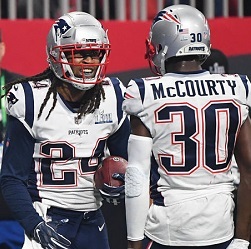 They trusted cornerback Stephon Gilmore to shadow the opposing team’s best or second-best receiver and used safety Devin McCourty as help over the top for No. 2 and 3 cornerbacks JC Jackson and Jason McCourty. The Patriots are a game-plan defense, but this was unlike any changes they’ve made all year. So, the Patriots came out in zone Sunday in their 13-3 Super Bowl LIII win over the Rams. Jackson took on a reduced role covering tight ends. Gilmore typically followed wide receiver Brandin Cooks out of the huddle but didn’t shadow him. Patrick Chung played linebacker near the line of scrimmage before breaking his arm. Cornerback Jonathan Jones played strong safety, keeping an extra set of eyes on wide receiver Robert Woods. In the lowest-scoring Super Bowl ever, the Patriots scored the fewest points for a winning team. And they still prevailed decisively thanks to a defense that didn’t give up touchdown, neutralized a running back who was in the league MVP conversation all season long, and made a head coach that has been labeled an offensive genius look overwhelmed and unprepared. Of course, the vast majority of mainstream media outlets ignored that kind of thing, and social media certainly wasn’t abuzz with how great the Patriots’ defensive backs played. A lot was made about L.A.’s dreadful offense. Aside from Belichick, however, not as much was made about the men who actually made L.A.’s offense look so bad. The Rams’ defensive backs shouldn’t be ignored, either. They kept Brady from throwing a touchdown for the first time in his nine career Super Bowl appearances. The Rams limited Brady to 262 yards in the air and a 71.4 Passer Rating. Last year, in the Pats’ Super Bowl loss to the Philadelphia Eagles, Brady threw for 505 yards and three touchdowns with a 115.4 Passer Rating. L.A.’s secondary unit — led by Marcus Peters, LaMarcus Joyner, Aqib Talib and John Johnson III — deserve props as well for a great game. The ironic part is that before the defensive backs in Super Bowl LIII were overlooked and underappreciated, defensive backs were honored by the Pro Football Hall of Fame in grand fashion. On Saturday, the Hall welcomed an eight-member Class of 2019 that includes three defensive backs: three-time All-Pro cornerback Champ Bailey, three-time Super Bowl champion cornerback Ty Law, former NFL Defensive Player of the Year and Super Bowl champion safety Ed Reed, and AFL/NFL star safety Johnny Robinson, who won three AFL titles and a Super Bowl ring. If my research is accurate, that is the first time in history that four DB’s will be inducted in the same class. The reaction to and coverage of Super Bowl LIII, however, was a glaring example of how defensive backs are often among football’s forgotten heroes. It was enough to motivate me to press on and keep doing my part, as small as it may be, to shine a light on athletes who deserve more of it. Great article, I thought the both teams’ DBs played really well but were underappreciated.